To break in, the company built a strategy based on temporary, experiential retail spaces, strong social media marketing and notable acquisitions of Nasty Gal and PrettyLittleThing — two companies already established with Boohoo’s core demographic of college-aged consumers. 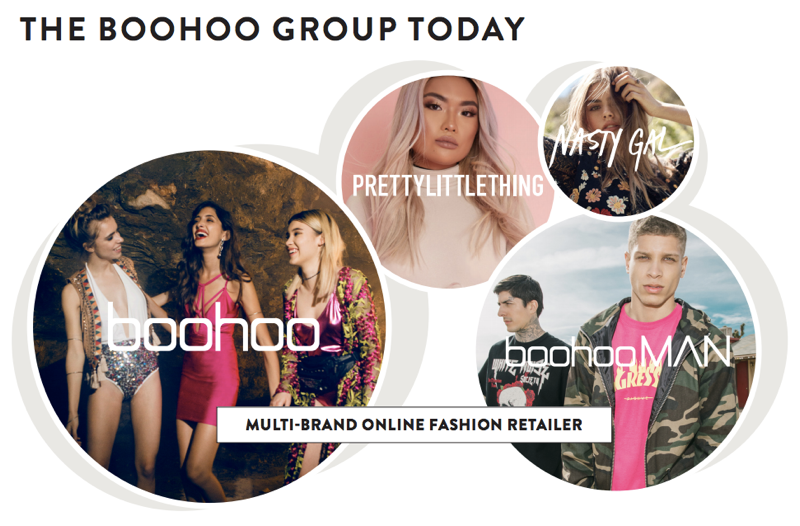 Boohoo says that it adds up to 100 products to its site per day by investing in a small number of inventory per item at first. If demand is low, the items sell out and disappear. If demand is high, Boohoo doubles down in its investment of a particular trend. As a result, customers are continuously checking back for new styles, sifting through up to 20,000 products live on the site at any time. In the U.K., Boohoo claims to be the third-biggest online retailer by market share, after Asos and Next. To get its footing in the U.S., the company drilled down on college-aged women by hosting college-area pop-ups and mining Instagram (the company reportedly sees 13.4 million annual interactions on the platform) to identify what styles are trending with this age group. ​All this looks very smart. For at least a year, 70% of its traffic is mobile and at least half of the checkouts happen on mobile as well.